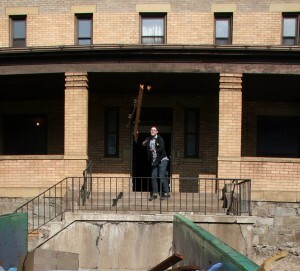 As far as scenic ruins go, the Pittsburgh metropolitan area sets a high standard. The natural beauty of the Monongahela Valley and the built legacy of deindustrialization make gorgeous scenery out of blue-collar defeat. Beauty is no compensation for lost jobs though. The old steel towns of this region have been imploding for decades. No place has lost a greater share of its population than Braddock, Pennsylvania, just outside Pittsburgh. This ravaged, near-empty stretch of abandoned homes, storefronts, and buildings was once a storied cornerstone of the industrial age. After losing 90 percent of its peak population, today it looks more like the nightmare at the end of the American Dream. A concrete, bunker-like building sits back from the rubble on Library Street there. A freight container has been stacked on top of it, adding living space to the building in the most conspicuous way possible. The door is marked with a sticker: a parody of the popular street art stencils of Andre the Giant’s face, but with the word “MAYOR” in block letters where the stencil would ordinarily read “OBEY.” Through that door and up a flight of stairs, a massive, six-foot, eight-inch man with a shaved head and goatee is perched on leather furniture amid avant-garde decor, fielding phone calls and drinking a bottle of Yuengling. It’s as if Andre the Giant himself has come back to life and moved to the Monongahela Valley to do advanced degrees in urban studies and interior design. It’s not your average mayoral residence. But Braddock is not your average Pennsylvania town, and its mayor, John Fetterman, is as far from being an average mayor as you can get. “I first came to this town as an Americorps volunteer working with at-risk youth. 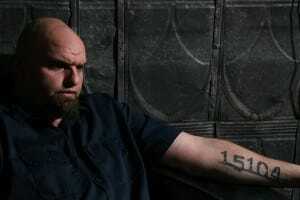 And I was just amazed with the place, its history and architecture,” says Fetterman. The mayor is an imposing character; he resembles a professional wrestler but speaks with the articulate voice of the masters degree in public policy he got at Harvard. Using his left arm (which bears a large tattoo of Braddock’s zip code), Fetterman gestures toward the rubble-strewn wasteland around Library Street, as if the view explains exactly why he fell under Braddock’s spell as a young man. In the process he began promoting his adopted home to friends, spreading the word to artists that live-work spaces could be found in Braddock for little money. With his appetite for the challenge growing with each small success, Fetterman jumped at the chance to run for the part-time job of being the community’s mayor in 2005. After winning the Democratic primary there by just one vote, John Fetterman became the mayor of an economic disaster zone. He began an unorthodox reconstruction program, calling on urban pioneers to help rebuild a devastated place, but not for the gentrified benefit of real estate speculators. In a part of the country where Braddock is only the hardest-hit example of hundreds of de-industrialized places, any success at revitalization through green design and the arts here might light a path for other small rust-belt cities out of poverty and population loss. But larger questions about the lack of jobs cast a shadow over such hopes, and a new expressway proposed to run straight through Braddock threatens to kill the town’s last chance at resurrection in its crib. The town has fewer than 3,000 residents left, according to the 2000 census (down from a peak population of 20,879), many of whom are elderly or struggling with health issues, addiction, or poverty. For those who remain, Braddock has little to offer in the way of work. Indeed, many of the town’s few remaining jobs are filled by blue-collar commuters from Pittsburgh or the suburbs. Lifelong Pittsburgh resident and postal worker Leanne O’Connor describes commuting to work in Braddock: “The post office had transferred me to work out of the location on the far edge of Braddock. Taking the bus there to work up Braddock Ave. every day the driver would always tell me I should try to work somewhere different, that it was too dangerous for me here.” Leanne took him up on his advice, after being mugged at knifepoint on that bus the following week. Braddock is a unique place, not only in the hardship it faces today, but also in its historic significance. What Independence Hall is to the American Revolution, this area is to our country’s century of steel. Robber baron Andrew Carnegie built his first steel mill in Braddock, and across the river is the spot where he once sent a private army to stage an armed attack on the striking workers of his Homestead plant. Frick Park, up the hill from Braddock, is named for the hated factory boss who a young anarchist tried to assassinate in revenge for the attack on Homestead. Carnegie, nervous about his public image, built the first of his many public libraries in Braddock, where it still sits across the street from Fetterman’s house. The area has perhaps more labor history per square mile than any other place in the nation. Up Braddock Avenue to the east are electronics factories where America’s domestic Cold War was fought out with fists and union elections between pro- and anticommunist workers. A few miles west in Pittsburgh is the downtown office building where the CEO of US Steel and his arch-nemesis, John L. Lewis of the Steelworkers Organizing Committee, used to tensely ride in the same elevator to work every morning. America has many industrial places, of course. But just as the Declaration of Independence was only signed in Philadelphia on July 4, 1776, only here did steelworkers fight and win the Battle of Homestead on July 5, 1892. These Monongahela Valley cities grew up as oppressive company towns, built to house the immigrant workforce of the nineteenth century’s mines and mills. With their flaming smokestacks and climate of fear and toil, the comparison newcomers made most often was to hell. But over the years, residents transformed them into bastions of working-class prosperity and democracy, through lifetimes of work and saving—and the titanic struggle for collective bargaining and labor unions. 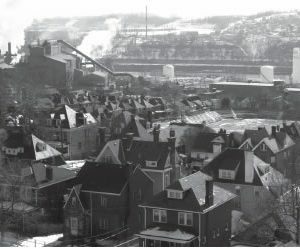 One of the central novels of the immigrant experience in industrial America, Out of This Furnace, was set in Braddock. In it, author Thomas Bell—son of a Braddock immigrant family and a worker in the mills himself—follows several generations of the Dobrejcak family through the ceaseless hardships of industrial life in the Monongahela Valley, culminating in the victory of the steelworkers union in the late 1930s. Closing on such a note was no mere Popular Front triumphalism. For working people like the Dobrejcaks of Braddock, industrial unions brought a sea change in living standards, social status, and political power. The American Dream only came to the Monongahela Valley because its families would not stop working and fighting for it. Since most of the landmarks of that struggle lie in unmarked ruins around Braddock today, works like Out of This Furnace are the last reminders of how America was built in places like this. Braddock’s contributions to the social realist canon have continued in our time, particularly with the films of Tony Buba. Buba—like Bell, a son of an immigrant millworker family—grew up in Braddock when it was the relatively prosperous picket-fence community that generations of workers had struggled to create. After putting in some time in the factories of the region as a young man, Buba went to college to study filmmaking amid the cultural ferment of 1968. As Buba points out, the town was in part a victim of its own successes. “After a couple generations of steelworkers having pretty good union contracts, plus the GI Bill, it became possible for workers to move out of the area. I mean, these were small homes built right next to all the noise and dirt of the mill. Workers started being able to have a house a little further out in the suburbs, and a car to drive to work in. Which was an example of success, really, a thing that was basically good.” The rise of strip malls and suburban big box stores also decimated the old small businesses of Braddock’s once-famous retail corridor. The decline Buba began to document took an ugly, unexpected turn in the 1980s when crisis in the steel industry brought hundreds of thousands of layoffs in the Monongahela Valley. “Believe it or not,” Buba continues, “in the late seventies we thought that Braddock had reached its rock bottom. There were studies done then that said it would drop to twelve thousand people and that would be it!” Buba laughs darkly. Much worse was to come. The steel industry entered a death spiral of layoffs, plant shutdowns, reductions in pay and benefits, strikes, and eventually a wholesale shedding of its workforce. The Pittsburgh region was racked with home foreclosures and evictions, bankruptcies, suicides, alcoholism, violence, and despair. 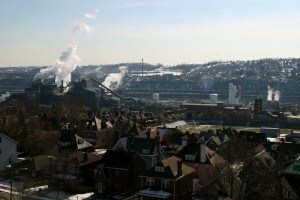 Braddock, having already begun to decline for several decades before steel’s crisis in 1984, found it could sink much further. These events hurt everyone in the region, but some communities bore greater burdens than others. Buba’s film Struggles In Steel chronicles the historic battle African Americans had waged—with both the steel companies and elements in the steelworkers union—to gain equal access to the good jobs in the plant. 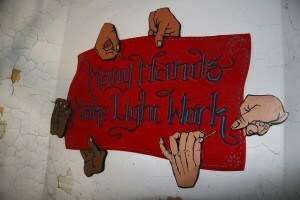 By the late seventies this progress had finally resulted in substantial numbers of black workers finally breaking into job seniority (blacks had been denied access to better jobs because their job seniority counted for nothing when they bid on a different job) and shop steward leadership positions, only for all to be lost in the plant closings. 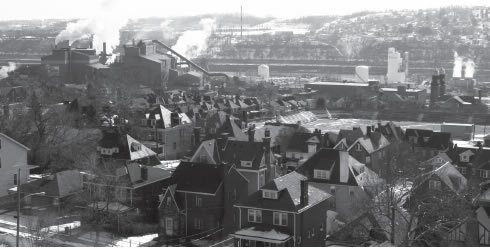 Beyond job racism, there was a residential aspect to the situation of blacks in the Monongahela Valley. As Buba notes, “There was redlining. Heck, the GI Bill which got a lot of people their first home, really, it was made to be for white guys to move to the suburbs.” The African-American community in the area was in the doubly precarious situation of not having had the benefit of generations of industrial employment to build up savings and seniority before the plant closings began, and being redlined out of homes in other areas. Alongside the steel crisis was the country’s rightward turn and Reagan-era cuts in social spending. With the plagues of crack cocaine, HIV/AIDS, and endemic street violence added, places like Braddock faced a “perfect storm” of urban devastation. Tony Buba’s cinematic requiems for Braddock may not wind up being the best-known films set there, however. The film version of Cormac McCarthy’s post-apocalyptic masterpiece The Road, starring Viggo Mortensen, shot its opening scenes in Braddock. Booking a high-profile role is a real coup for a town desperate for any activity at all, and comes thanks to the mayor’s constant hustle to promote Braddock to the country’s creative class. The film offers a sad bookend to Braddock’s historic arc. Once the setting for a novel in which immigrants change a hellish company town into a humble but solid home through their work ethic and collective struggle, Braddock today is the realistic-looking backdrop for another writer’s realist description of America after nuclear holocaust. The question facing Mayor Fetterman and Braddock’s remaining residents is: When a town goes from Out of this Furnace to The Road in the space of three generations—from hell to heaven and then back to hell again—what next? Given such a lack of the basic amenities of urban life, the first three years of his term have seen some quick progress. Fetterman ticks off the accomplishments as he drives by them on another impromptu tour of town: Braddock’s first basketball courts have been constructed, and its functional green space increased substantially with abandoned lots renovated into parks and gardens. A community-supported agriculture project called Pittsburgh Grow now operates an urban farm under the bridge into town. Considering this reality, Fetterman continues, “So, the second half of the work I try to do is bring new things in. New people, new energy, new economic activity. Because if we cannot start to replace the people and the tax base that’s been lost, then there’s only so much we can change.” Fetterman has been promoting the town to artists and urbanists seeking affordable live-work spaces away from the pretensions and costs of hipper cities like New York. Indeed, if Fetterman’s strategy is to both improve urban services for the existing old residents while also attracting creative new ones, some of the most dynamic results have come from mixing the two strategies. One new resident put his skills as a muralist to work with local kids on making a giant new “Welcome To Braddock” mosaic sign. Fetterman has championed the classic remaining small businesses of Braddock to newcomers, and the Elks Lodge bar has replenished its customer base by swearing in dozens of young new members and hosting punk shows. So many do-it-yourself renovations are under way in churches, stores, homes, and other buildings that hardly a block is untouched by the civic energy of Fetterman’s incoming Braddock enthusiasts. Tony Buba doubts the efforts will lead to gentrification. “The town lost 90 percent! They’ll never fill all the buildings. This whole region has had more empty properties than it will ever be able to fill, ever since the eighties,” he says. Certainly Braddock is a bit more off the beaten path than the upwardly mobile real estate of Brooklyn or San Francisco’s Mission District. It’s a very long bike ride from here to Pittsburgh’s college campuses (even on a fixed-gear bike), and the Monongahela Valley does not exactly have as many house-hunting yuppies as the Silicon one in California. Buba compares the newcomers to the local activists who first re-opened the library Vicky Vargo works at, saying, “In the late seventies, a group of activists got together to reopen the abandoned Carnegie Library, and they had a lot of great programs out of there too. It was all part of a time here, when a lot of the socialists from the sixties…were getting jobs in the steel mills, getting involved in the union,” and producing a variety of media and art on blue-collar life in the area. There is a strong environmental subtext to Fetterman’s program in Braddock. The first new businesses to open up there under Mayor Fetterman’s time in office are two workshops—one that converts diesel engines to run on the ecologically sustainable alternative “bio-diesel,” and another that builds furniture from recycled materials. Moreover, Braddock has gone from having no parks to having both a large urban garden and farm—and Fetterman sits on the board of the agency working to turn the nearby abandoned Rankin steel mill into a national park and open-air museum of the area’s industrial history. Beyond such grassroots efforts, there is a larger ecological vision implied in the entire project of reclaiming devastated urban space. In an age of skyrocketing fuel prices and global warming, in the coming decades the United States will be forced to cut its carbon footprint to a sustainable size. However, the built environment the country has constructed in the past fifty years will make such frugality incredibly difficult. The miles and miles of suburban sprawl that extend from rust belt to sun belt, full of enormous McMansions and ninety-minute commutes, will be a source of deep economic pain as energy costs continue rising. Such an innovative environmentalism makes the current threat to Braddock’s existence an especially bitter pill. Despite so much potential for a greener, economically viable Braddock, the Pennsylvania Turnpike Commission is dusting off old plans to run a new four-lane toll road expressway straight through the town. The proposed Mon-Fayette Expressway would provide some drivers with a faster commute, at the expense of demolishing a good bit of Braddock and its neighbors. Jim Straub is a dishwasher and hired gun for the labor movement. Bret Liebendorfer is a journalist and photographer. Both are based in Colombus, Ohio. Photo credits: all photos by Bret Liebendorfer.